Full disclosure – I was provided an advanced reader’s copy of this book by the authors but have voluntarily provided a review. 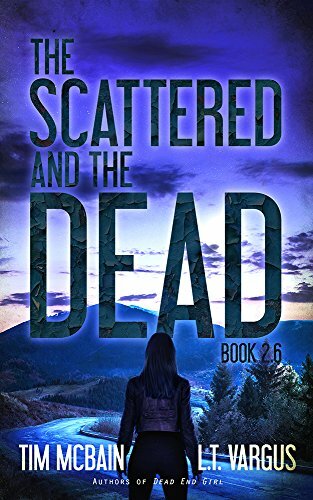 The Scattered and The Dead 2.6 is an interesting deviation from the other installments in this series. Where the previous books were staggered in whole and half numbers, here is the oddball out with a 2.6 to switch it up and keep you on your toes. Keeping with the theme of crafting the narrative through letters written by the characters, Erin and Izzy are once again featured in addition to a new character named Jeremiah whose timeline sees him dealing with the post apocalypse world a decade in the future. This one was interesting for me, especially after the shocking events of TSATD 2.5 to see Erin still communicating with her bestie almost two years after the events at the FEMA camp speaks to her hope that she will find her friend and adding Marcus and Marissa back into the story really illustrates the groups desire to try to find some semblance of normalcy during the chaos. Jeremiah is a soldier in the future on a scouting mission with his team and with the narrative being in the form of a meticulously kept diary, I think his story was the highlight of the book. Through Jeremiah’s narrative, we get another glimpse of the post-apocalyptic future and the barbarous hierarchy that has developed. While it wouldn’t be impossible to read this new book out of sequence, to best appreciate the story thus far and the world that has been brought to life you may want to at least read the main books as a primer. If you haven’t started this series yet, I would definitely recommend giving it a read. As far as post-apocalyptic stories go, McBain and Vargus have raised the bar with this series. I am looking forward to many more letters from the end of the world as this series plays out.